Multiple of 11 sts plus 2. Rows 1 and 2: Knit both rows. Row 3: P this and all uneven rows through 19. Row 4: * P 2, O, k 3, sl 1 st, k 2 tog, psso, k 3, O, repeat from * across, end with p 2. Row 6: * P 2, k 1, O, k 2, sl 1 st, k 2 tog, psso, k 2, O, k1, repeat from * across, end with p2. Row 8: * P 2, k 2, O, k 1, sl 1 st, k 2 tog, psso, k 1, O, K 2, repeat from * across, end with p 2. Row 10: * P 2, k 3, O, sl 1 st, k 2 tog, psso, O, k 3, repeat from * across, end with p 2. This completes pattern, repeat rows 3 through 10 for another pattern. Row 20: (K 2 tog, k 1, k 2 tog, k 3 tog, k 3, k 2 tog, k 3, k 3 tog, k 3) twice, k 2 tog, k 1, k 2 tog, k 3 tog, k 3, k 2 tog. There are 38 sts in this row. Row 21: With right side toward you, k 8, (k 2 tog, k 1) twice, k 4, k 2 tog, k 4, (k 2 tog, k 1) twice, k 8. There are 33 sts in this row. Rows 22, 24, 26, 28, 30: K each st.
Row 23: K 14, inc in each of next 4 sts, k 15. Row 25: K 16, inc in each of next 4 sts, k 17. Row 27: K 18, inc in each of next 4 sts, k 19. Row 29: K 20, inc in each of next 4 sts, k 21. You now have 49 sts. Row 31: * K 1, O, sl 1, repeat from * across, end with k 1. Row 32: * O, sl 1, k tog the O and sl st of previous row, repeat from * across, end with k 1. Row 33: K 1, * O, sl 1, k tog the O and sl st of previous row, repeat from * across. Repeat Rows 32 and 33 four times. Row 42: * K 1, k tog the O and sl st of previous row, repeat from * across, end with k 1. There are now 49 sts. You are now ready to start decreasing for sole of bootee. Row 43: With right side of work toward you, k 2 tog, k 22, k 2 tog, k 21, k 2 tog. Rows 44, 46, 48, 50, 52, 54: K each st.
Row 45: K 2 tog, k 20, k 2 tog, k 20, k 2 tog. Row 47: K 2 tog, k 19, k 2 tog, k 18, k 2 tog. Row 49: K 2 tog, k 17, k 20g, k 17, k tog. Row 51: K 2 tog, k 16, k 2 tog, k 15, k 2 tog. Row 53: K 2 tog, k 14, k 2 tog, k 14, k 2 tog. Fold and sew down back and across sole. Work a row of sc between the last row of pattern and decrease row for sole of bootee. Cord: With double strands of yarn, crochet a chain 15 inches long and finish by tying a knot at each end. Lace cord along last row of second pattern (on cuff). 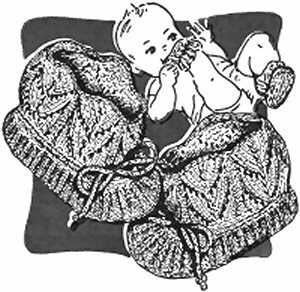 For larger bootee use heavier yarn and repeat rows 43 and 33 six times instead of four.